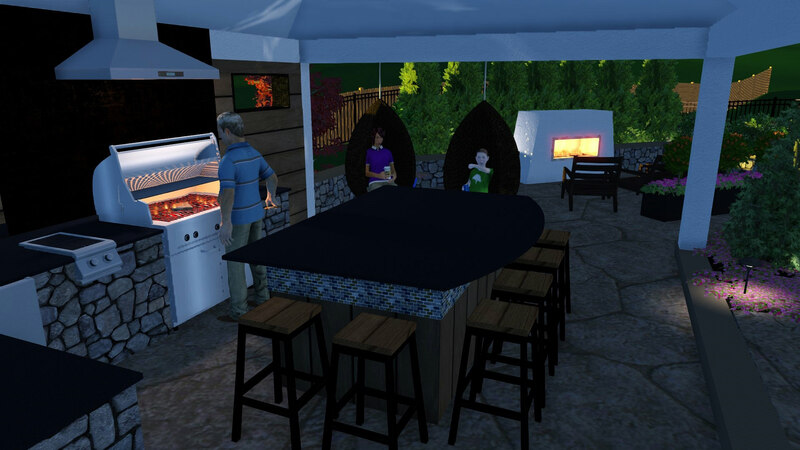 This busy family was looking for a complete outdoor living space that had something for everyone, yet also act as a hub to spend time together to enjoy each other’s company. 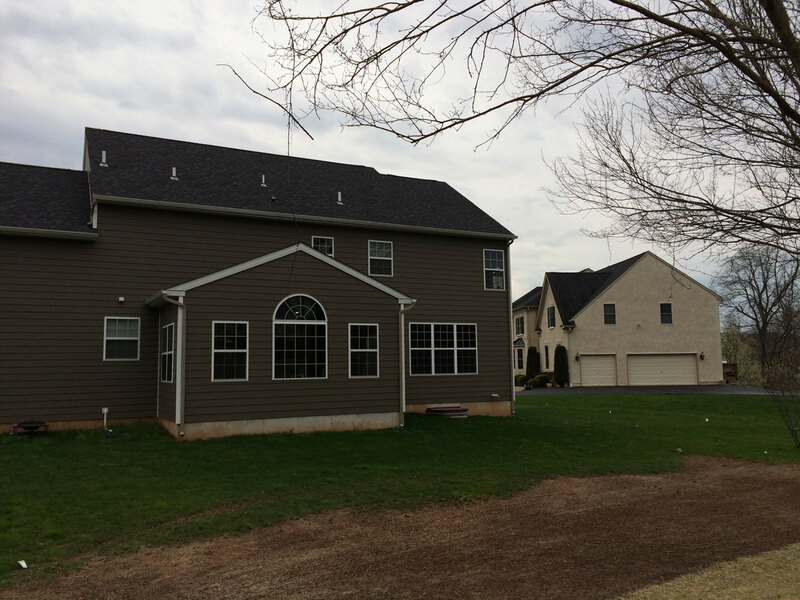 Hear what the Gazzillo family has to say about their very own backyard transformation! This family knew there was hidden potential for their backyard but were having difficulty imagining what it could turn into! While the backyard had a slight pitch and wasn’t very deep, MasterPLAN saw the opportunity to level it off and create an outdoor living space that would wrap around to offer many destination zones for the whole family. 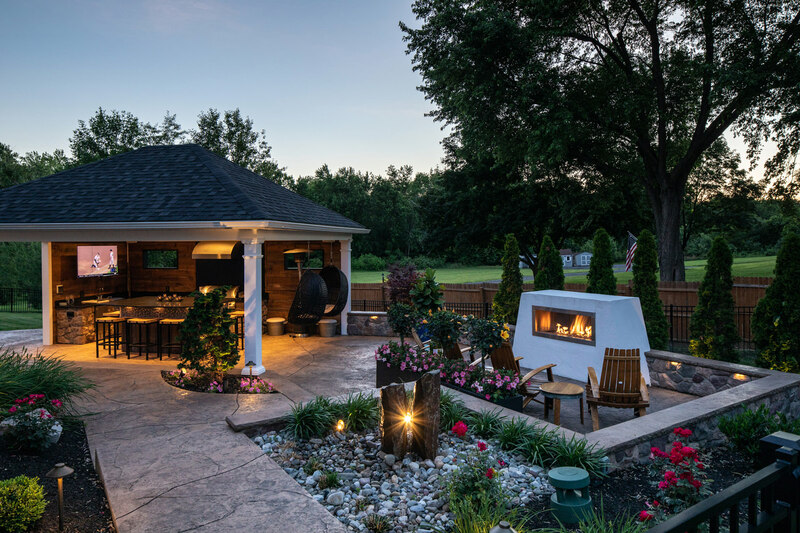 The first destination in this MasterPLAN Outdoor Living space is complete with a custom natural gas fireplace, nearby basalt spire water feature and surrounding seating wall to create the ultimate cozy relaxation and conversation zone. 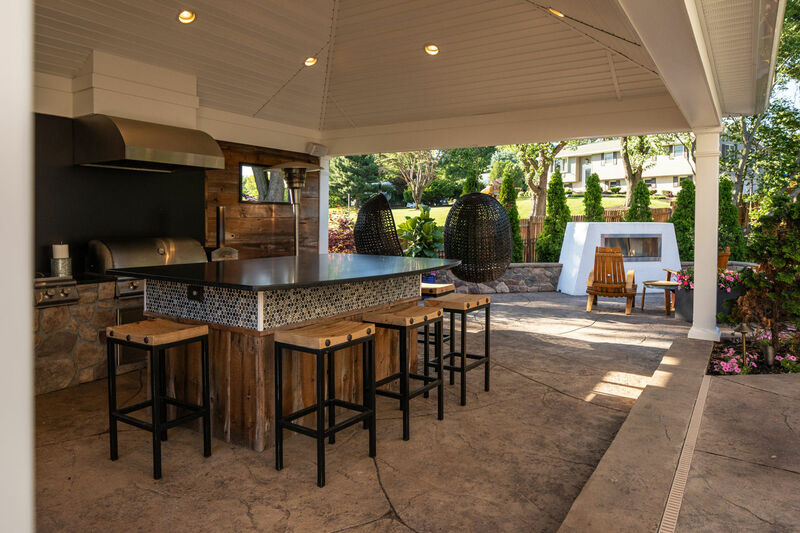 Not only does this custom pavilion provide shelter from the elements, it is also the entertainment hub for cooking, hanging out and watching the big game! Fun features like the client’s hanging pod chairs provide a personalized touch to the space. 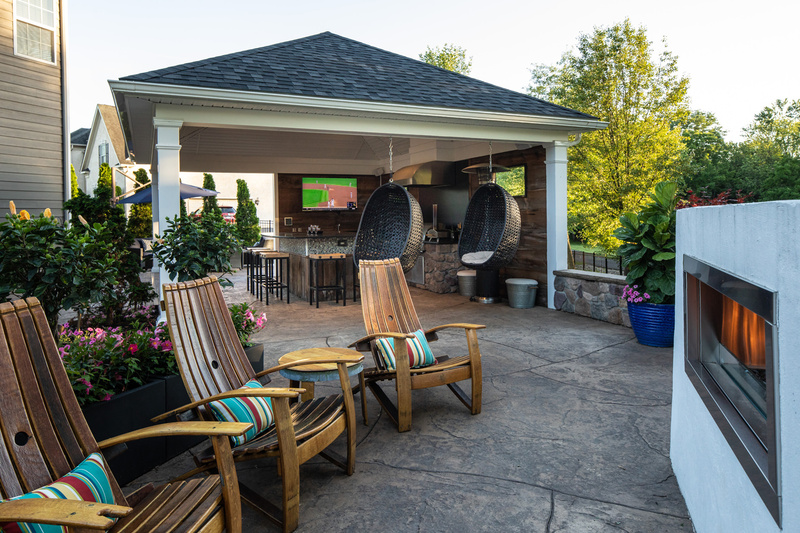 Whether the action is in the outdoor kitchen or the nearby fireplace or lounge space, the clients are never far away from the action! This open floor concept is ideal for entertaining, it creates an inviting and seamless transition throughout the whole outdoor living space. The oversized granite kitchen island is the perfect place to gather in the kitchen. This space allows everyone to be in the mix and among the awesome kitchen amenities! 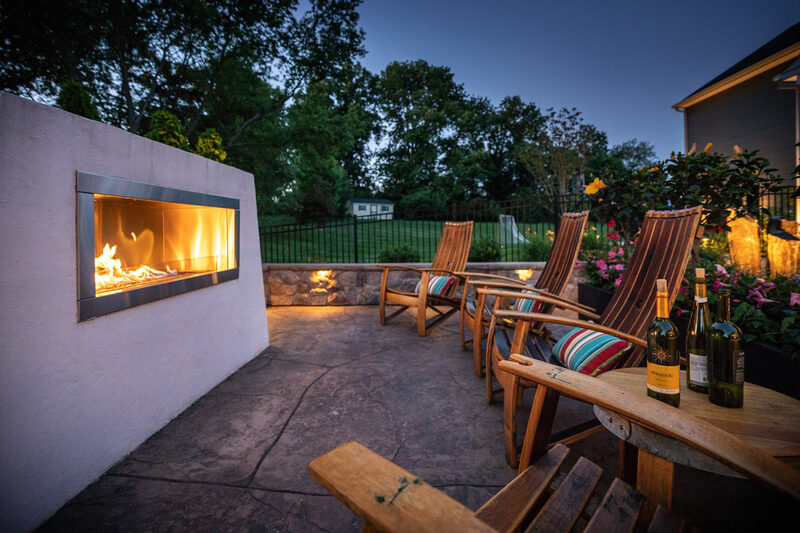 When the sun sets low, this outdoor living space comes alive! 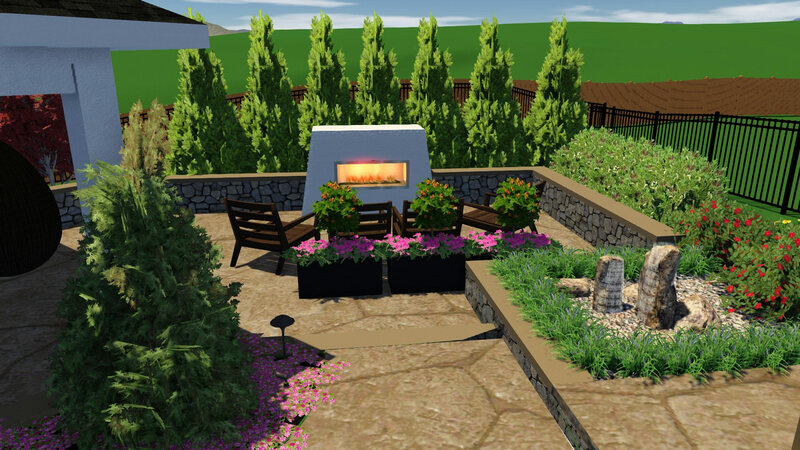 Low voltage accent lighting beautifully highlights the features and colorful plantings around the patio while the fireplace adds warmth and a romantic ambiance to the environment. This photo captures the perfect balance between structure and landscape supporting and complementing each other to create a lovely and harmonious outdoor living space. 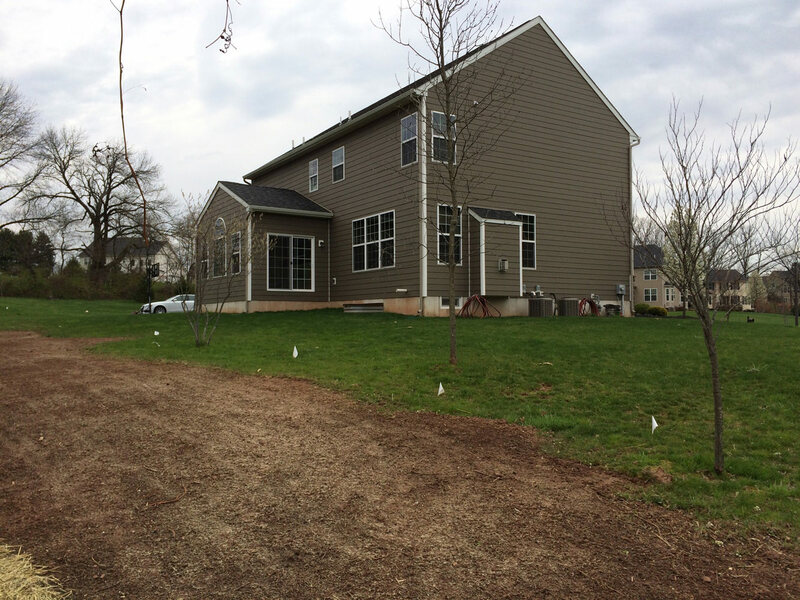 Being an active household, it was important that this family have an outdoor space for fun and entertaining, however their uneven and sloped blank-slate backyard was just not going to cut it. 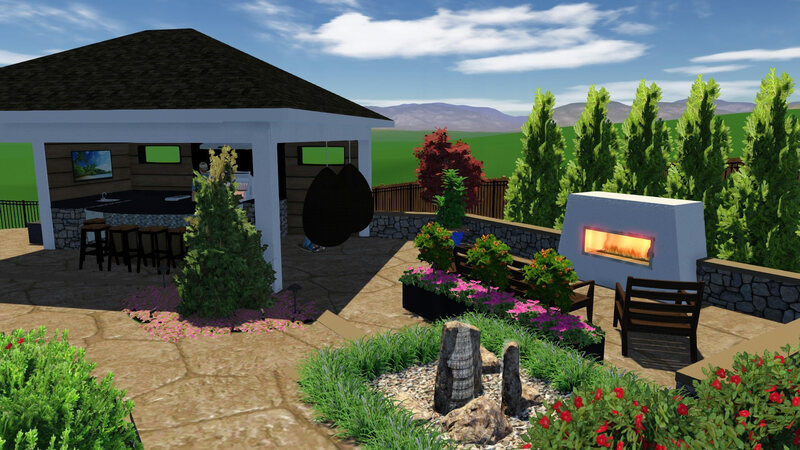 Given several client wish list items, we knew that our custom 3D design plans would be beneficial in showing how all features would look and integrate together, forming their outdoor living master plan. A home’s kitchen is intrinsically where everyone gathers, keeping this in mind, we opted to give the outdoor kitchen the same attention. We knew we needed to incorporate all kitchen necessities for functionality: ice maker, double-drawer refrigerator, grill, ample storage and, yes, even the kitchen sink. The granite-top kitchen island was significantly sized so all guests can relax and interact with the chef at work. To give the kitchen structural protection from the elements and a place for summer respite, we designed the custom pavilion to act as the main focal point from inside the home. The pavilion’s feature walls were added to enhance the privacy of the space and we incorporated two pass-through windows to allow for a comfortable cross-ventilation. The reclaimed barnwood clad walls offer a rustic and contemporary flair, while the black matte corten steel behind the grill gives off a dramatic yet complimenting aesthetic. As if this kitchen couldn’t get any greater, an outdoor-rated television and surround sound system was installed so these Penn State fanatics don’t have to retire inside when it’s game time! Following the naturalistic stamped concrete patio to the right of the kitchen, the clients installed two awesome hanging chairs to give the space their personalized twist! These hanging pod chairs are one of our favorite pieces of the project, not only are they fun to look at and resemble magical pieces of art, but they are super relaxing and make you feel like a kid again. Moving further along, we come to an area meant for relaxation and conversation. The custom fireplace was designed to be super simple yet also make a statement. The natural gas unit fires up with a push of a button and adds a nice ambiance at night which innately draws people to congregate, tell stories and create memories. Using special efficiency, we were sure to add walls around this space to double-up as added seating! Behind this warm destination zone, we introduced tall planters to break up the space and added tons of tropical color and fragrance. Nearby, you can hear the gentle trickle of the natural basalt spire water feature for added zen. Not only does this feature look beautiful, but it is remote controlled and has an auto-fill valve to maintain its water level. Less time maintaining and more time enjoying is always the goal! On the far side of the pavilion, we created an additional destination zone. This space can be used for a firepit fit for s’mores and ghost stories or an amazingly comfortable lounge set to let the day’s worries fade away. Surrounding the outdoor living space, we installed a black matte aluminum fence to keep Bailey, the family’s furry princess in, while keeping the pests out. Low-maintenance landscaping and landscape lighting was added around the project to soften the space and further create a peaceful and beautiful space for everyone to enjoy. "The process is incredibly easy with MasterPlan. They make it enjoyable, fun, and easy on the family!"